Prints of this image are available to purchase, find out more here. As an aside, this image also influenced an article of mine on image theft when I discovered someone else had entered it in to a Dutch photographic competition, passing it off as their own! This was taken back in May 2007 during a week long stay on The Isle of Mull just off the west coast of the Scottish Highlands. The island is full of sheep and highland cows as you would expect and after the first day you get so used to seeing them you get bored of pointing the camera in thier direction. On one of the last evenings we pulled up to the house after a day out shooting to be treated to some young lambs playing around in the field next to the house. We jumped out the car and I just thought I’d fire off a few shots for the fun of it as I’d not seen this behaviour before except on tv. They were jumping up and down like they were on trampolines and head butting each other and just generally acting a very hyper. They would vanish for a minute over the top of the small hill in the field and you’d hear them baa’ing as they come running over the top of the hill chasing each other at full speed. It was all we could do to keep them in our viewfinders as we were laughing so much at the antics in front of us. I set my D2x to high speed crop mode to make full use of its 8fps shooting speed and just kept on firing away until they stopped playing which was only 10 minutes or so. So close but just not right. 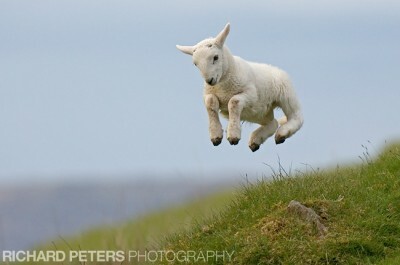 Eventually as I got near the end of the photos I came across an image that was framed well and the lamb was sharp…I’d caught him with his front legs up and his hind ones still on the ground and I knew this was going to be my best chance of getting the shot. Despite the speed of the camera I knew they jump around so fast that the next frame could well be yet another ‘almost’ shot with him already on the way down. Thankfully to both my delight and humour, the next shot had caught him perfectly at the top of his leap with legs tucked in nicely – whats even funnier is he looks like he’s smiling in the photo, like he knew I’d got him! As you can see from the sequence below the very next shot had him already back on the ground so it really was a very close call!